Did you enjoy Pitch Black and want more of Riddick's world? After Chronicles of Riddick, did you wonder where the series would go next? In 2000, Diesel starred as a ruthless anti-hero, Riddick, in the sci-fi horror movie, Pitch Black. In 2004, Vin Diesel and director David Twohy teamed up again to make Chronicles of Riddick. Chronicles took some of the characters from Pitch Black and turned it into a sprawling epic sci-fi universe with Riddick battling death-worshipping warriors called the Necromongers. In 2013, the duo came out with Riddick, the long-awaited sequel to Chronicles of Riddick. But the movie (which critics found a strange blend of Pitch Black and Chronicles) wasn't what they originally intended. They weren't able to create the sequel they wanted, and the story behind it tells their boldness and vision. [For the next film,] you have to go to the Underverse, you want to go to the Underverse and you'll have to go through the Underverse to get to Furia. So, those are the two stories that are mapped out...the next film, Riddick is going to go to the underverse. Riddick will act with new elementals. Not air elementals [as Judi Dench's character is] but fire and water. It'll come full circle in C3 when he must return to Furia...We knew we could get away with a PG-13 on the first one, but once you go to the Underverse it's rated R, because it's a place where war is the norm and there is constant, constant battling. Then on Chronicles 3 we will see Riddick return to Furia, to deal with the homeland. The next movie in that succession if we were making studio movies would have been I think straight into the Underverse, do kind of an Orpheus Descending myth in the Necromonger Underverse. It would've been a big movie too, but also PG-13 so maybe it’s for the best. The Underverse is a constellation of dark, new stars. The Necromongers consider it their promised land; that only the Lord Marshals of the Necromongers are known to have journeyed to. In this verse... Life is antagonistic to the natural state. Here humans, in all their various races, are a spontaneous outbreak. An unguided mistake. Our purpose is to correct that mistake, because there is another verse. A verse where life is welcome, cherished. A ravishing evernew place called Underverse. But the road to that verse crosses over the Threshold. Still kind of vague, but we have an idea of where it would go. Unfortunately, Chronicles did poorly at the box office, grossing only $55 million of its rumored $150 mil budget. After the critical and financial failure, the studio wouldn't agree to a sequel. Diesel was dedicated to making one happen. He did everything from agreeing to make a cameo in The Fast and the Furious: Tokyo Drift in exchange for the rights to Riddick, all the way to mortgaging his own house. Yet even all that wasn't enough to let them create another sprawling epic like their imagined Necroverse movie. As a way of trying to breathe life into the franchise, they created a scaled-down, cheaper movie with elements closer to the first movie. Both Twohy and Diesel have expressed hopes that they can one day return to Riddick and create the original sequels as intended. While I think Chronicles had its flaws, I admire their determination and dedication to this world. Here's hoping they one day can return to their original vision. Would you have seen Chronicles 2? Do you think the franchise has a future or run its course? I like the idea, but probably would have waited till it came out of the theaters. 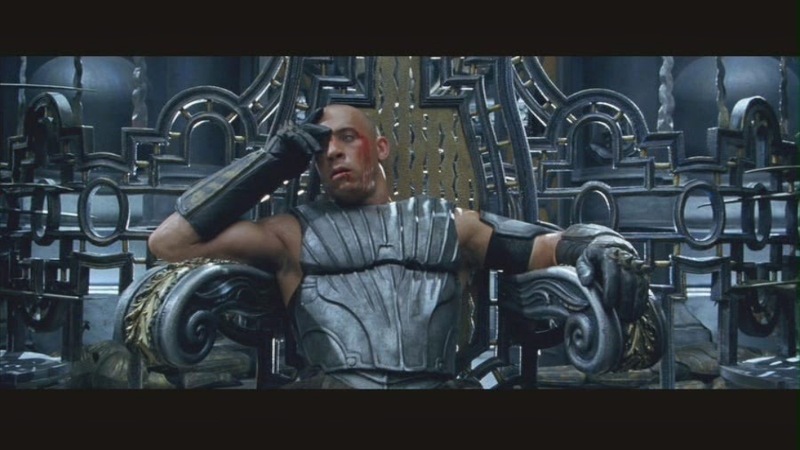 I've always loved Riddick. While I'm not a huge fan (now that there are three films, I imagine that there are some of those? ), I support the character's existence, and look forward to experiencing either the movies (haven't seen the new one yet, alas) or the character again. So all this talk of what might have been/still could be is pretty interesting. When Chronicles was released, it was just too early. Now we live in franchiseland. I think if they'd handled Chronicles better, there could have been sequels. It just wasn't that good though. And they should have stuck with R rated material. Softening it for kids just ruined the film. I think I liked the film and yes... would love to see more films of this franchise. I think if the story needs to be told, it will... though Hollywood will just reboot in 5 years. Change it to someone who is trending at the time, maybe make it a musical. Heck I am going to promote RIDDICK: MUSICAL, yes... sorry it's early and coffee not in system yet. I only saw the third one which at the end I suppose leave room to go back for one of those sequels but I doubt it did well enough that the studio would get behind another huge production. Love Pitch Black but Chronicles was a very wrong turn for the series. What made Pitch Black great was that it seemed like the people were *real*. They were on some kind of commercial transport with real people with jobs who had real problems, and then this messed up thing happened. Riddick was tough, but not unstoppable. Exceptional, but not invincible. His fight with Johns was great. Even though he won, he still had to try really hard to beat him. In Chronicles he beats down 5-10 guys at a time, catches people by the throat with one hand and throws them. Plus, the whole Necromongers thing didn't seem fully realized. It didn't seem like the two movies could exist in the same universe (that was also a problem with Dark Fury, the animated movie). The recent "Riddick" was ok, not great, but I'd rather see more of that than more of Chronicles. Pitch Black was a great introduction to Riddick as a character, but I actually preferred Chronicles and Riddick, because they introduced a new and exciting universe to science fiction fans. My only issue has been that the movies are inconsistent. The first appealed to horror fans, the second to sci-fi fans and then the next Riddick instalment was a mix of both. They should pick a genre and stick with it, because it's a pain in the rear end for people who are legally old enough to see one of the films, but not old enough watch others in the series. That said, I can't wait for the next movie. The Riddick universe is brilliant and I need to see more of it. I'm tired of Star Wars and Star Trek, I want a new universe to escape into. Poll: Who's the Best British Villain of All Time? How Much Did the Damage in GODZILLA (1998) Cost? What if the Matrix Ran on Windows XP?